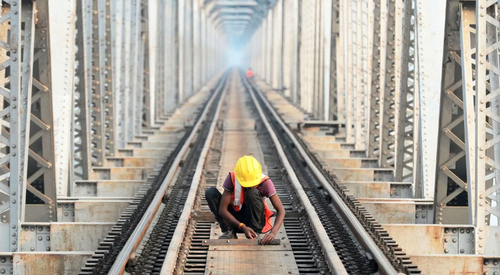 In February, the railway system in India announced that it was recruiting for some of the most basic and menial positions in its organizational hierarchy. It was looking for positions like helper, cleaner, track maintainer and rail switchman. It announced 63,000 vacant jobs it was trying to fill. It got 19 million applicants. Those applicants included people like Anil Gujjar, who traveled to India's capital in search of a job. Gujjar was the first person in his family to attend college, but wound up having to compete with millions of other men like him, almost all of which were college students or graduates. Some even had postgraduate degrees. 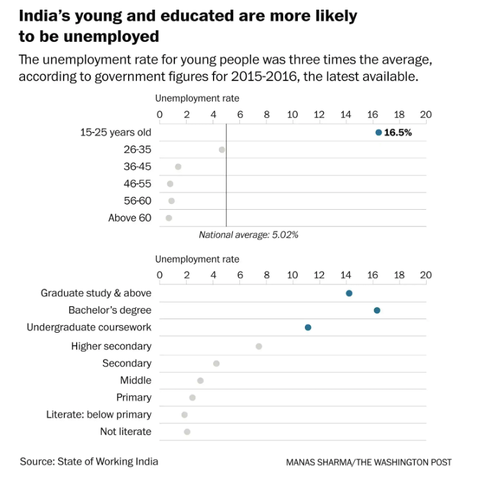 The flock to these jobs indicates a bigger problem in India: the country has a fast growing economy, but isn’t generating enough jobs for its educated young populace. A Washington Post article estimates that the number of people in India between age of 15 and 34 is expected to hit 480 million by the year 2021. They have higher literacy levels and are staying in school longer than any other previous generation. The surge of youths could be an immense opportunity for the country, if it can find a way to put them to work. But the employment trends in the country are not optimistic. The feat of staving off jobseekers has become a major political task for Prime Minister Modi, who is seeking reelection this year. 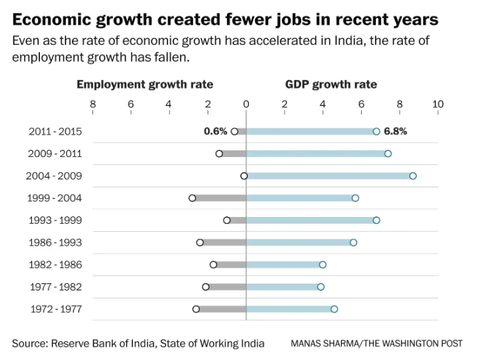 He rose to power promising job creation, but all of his attempts to increase domestic manufacturing and entrepreneurship have yet to help the employment cause. Further, Modi‘s decision to invalidate most of India's banknotes in 2016 resulted in about 3 million jobs being lost over the course of the first four months of 2017. The Center for Monitoring Indian Economy, a research firm in Mumbai, found that the Indian labor force also shrank between 2017 and 2018. As a result, finding a job is a job in and of itself for many young Indian people. Job scams are popping up across the country and an entire industry offering "personality development" classes in order to help make people more employable has popped up. The educated youth are waiting for good productive jobs instead of settling. Ajit Ghose, an economist at the Institute for Human Development in Delhi, says that the country needs to generate jobs not just for the 6 million to 8 million new workforce entrants annually, but also for people like women who are working less than they would be if they could get jobs at a decent wage. The same economist notes that India has about 104 million "surplus" workers. Another economist, Arvind Panagariya, argues that it is difficult to make an assessment of the employment situation until nationwide data is released. At a test center in Delhi, applicants for railway positions showed up three times a day, every day, from September through mid December. The same scene played out at hundreds of exam centers across the country. In fact, there were so many test takers that an economy was born out of job applicants. Entrepreneurs opened storage lockers and started businesses holding backpacks and phones for those going inside to take the test. Even though the rail jobs are low on the totem pole, they offered a comparatively good salary and benefits like free train travel. The applicants were almost all young men who are college students and graduates from the northern Indian states trying to get out of the villages where they grew up. Their reason for leaving home? There are no jobs there, either.